Dmitry Medvedev said that Russia will never send its citizens for trial in foreign countries, in accordance with the constitution, but stressed that the Litvinenko case must not prevent Russia and Britain from co-operating. 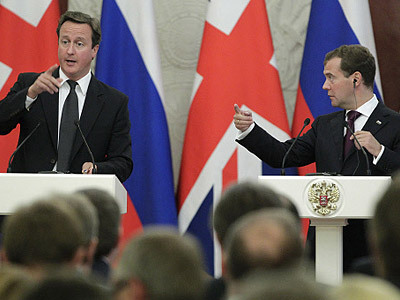 President Dmitry Medvedev and Prime Minister David Cameron held a press conference in Moscow on Monday dedicated to Cameron’s official visit to Russia. This is the first official visit by the head of a British government since the relations between the two countries became strained six years ago after the so-called Litvinenko case – the fatal poisoning of a former Russian intelligence officer in London. Medvedev and Cameron both said that the issue with the extradition of the suspect in the Litvinenko case remains unsolved, but both officials stressed that the differences in the legal systems of the two countries were the reason for this. They also stressed the necessity to work on other questions of bilateral relations. Russian President reminded the journalists that Article 61 of the Russian constitution forbids the extradition of Russian citizens for trial in foreign countries. “Everyone must respect their country’s fundamental law,” Medvedev said. “This will never happen” Medvedev said about the possibility of extradition of the suspect in Litvinenko’s case. The Russian president also stated that both countries should create firm guarantees for mutual investment. “Our task is to guarantee the necessary legal framework for investments,” he stressed. Olympic co-operation is another issue Russia and the UK should closely work together on, Medvedev believes. David Cameron said that there are disagreements and problems between Moscow and London on some issues, including the Litvinenko case. However, this does not mean that the sides should freeze their co-operation in trade, business and other areas. According to the British heads of the government, London supports Russia's accession to the World Trade Organization. As for the case related to Litvinenko’s poisoning, neither the UK nor Russia have not changed their approach toward the issue, the British PM underlined. The governments though do not pretend that these differences do not exist and intend to continue a dialogue on the matter. Earlier in the day, during his speech at Moscow State University, Cameron pointed out that Britain’s stance is “simple and principled – when a crime is committed, that is a matter for the courts.” It is their job to examine “the evidence impartially and to determine innocence or guilt" while the governments' job is to help courts to do their work. What Russia and Britain should do, “as mature and sensible countries, is try and see if we can build a relationship that is in our mutual interests,” he said. The prime minister noted that both states want to see a growth in trade, investment and jobs, progress and stability in the Middle East as well as working on nuclear non-proliferation. As for international issues, journalists were first of all interested in both sides’ positions on Syria. Cameron said that London supports Russia’s role in the international conference on Libya that was held on September 1. The participants agreed to assist the North African state’s transition to building a democratic state under the support of the United Nations. Moscow, along with other countries, recognized the National Transitional Council (NTC) of Libya as the current authority. Earlier on Monday, Dmitry Medvedev's aide Sergey Prikhodko told the press that he expected Cameron's visit to Russia to be "pragmatic and calm". "No one is expecting any breakthroughs," the Russian politician said. "Russia and the UK do not need 'resets,'" he also said. However, the Russian official noted that Russian-British relations have not always been completely friendly and understanding. "What has dominated them since Cameron's arrival is the progress in those areas that are important for Russian-British bilateral relations, the wish to expand co-operation on key regional and international issues. We have pointed out the pragmatic approach of the Cameron administration to bilateral co-operation," Prikhodko said. Prikhodko also touched upon probably the most acute issue in Russo-British relations – the investigation of Aleksandr Litvinenko’s poisoning in London in 2006. 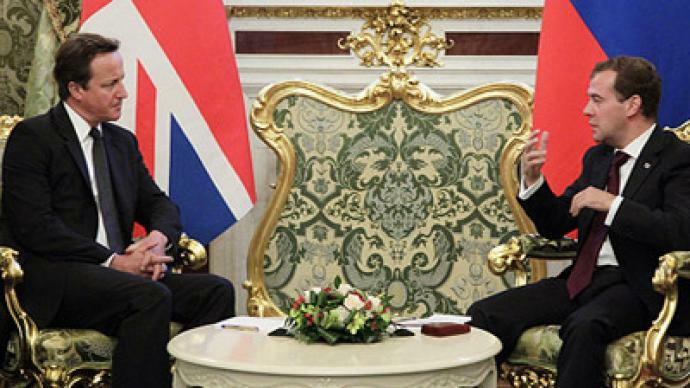 Prikhodko told the press that the Russian side had no intention of avoiding the issue during the British PM’s visit. "We have no plans to raise this issue, [as] we have other, more important issues. However, if they ask something, we don't have any forbidden issues," Prikhodko said. 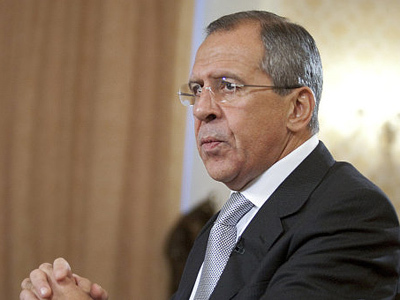 The official stressed that the Russian authorities maintained the same position over the issue. "Our law enforcement agencies informed their British partners about their readiness to work with them a long time ago," Prikhodko said. He also said that, in his view, the Litvinenko case will not have a serious influence on the development of Russian-British relations. Also on Monday, Russian news agencies reported that Andrey Lugovoi, a former Russian intelligence officer who is the prime suspect in Aleksandr Litvinenko’s poisoning case, said he was ready to meet with the British prime minister and discuss the relations between Russia and Great Britain. Lugovoi is currently a member of the Russian parliament, representing the nationalist political party LDPR. At the same time, Lugovoi called upon the British authorities to stop politicizing the situation and move on. Aleksandr Litvinenko, a former Russian security officer and a close associate of the fugitive Russian oligarch Boris Berezovsky, died in November 2006 in London of acute poisoning from the rare and expensive radioactive metal polonium. British prosecutors have demanded that Russia extradite Lugovoi to Britain, as regard him as the prime suspect in the crime. Russian law does not allow for Russian citizens’ extradition to other countries for trial without a trial at home, but the British side refuses to send their evidence to Russian investigators. Notwithstanding this, Lugovoi is now protected by parliamentary immunity.